Don Thompson, the CEO of The Center of Regenerative Design and Collaboration (CRDC), and his team’s ideas will affect all social groups in South Africa. Costa Rica, a country similar to South Africa in regards to its social needs, has been testing some new CRDC equipment over the last few months. This equipment can process absolutely any plastic and turn it into aggregate for the building industry. Soon, South Africa will be using this machinery for local building projects. The environmentally friendly durable product that CRDC are calling EcoArena PRA (Pre-Conditioned Resin Aggregate) and Ecoblock are the results obtained from using waste plastic as an aggregate. Combining standard cement and sand with their plastic aggregate results in a durable concrete block. You may recall from my previous article that you can currently purchase varies types of stone and other waste material to use as an aggregate in concrete. Using waste plastic aggregate offers some additional advantages. Only 21% of the 1.5million tonnes of plastic used in South Africa each year is recycled. Using this waste plastic in our building will help us clean up our environment. Job creation in regards to plastic collection, delivery, shredding, etc. No costly sorting of the plastic required. Even sandy and similarly contaminated pieces of plastic can be used. The development of this product in South Africa interests us very much and we can see how this initiative will affect the future of concrete. We would love to see it available in time for use on the Container House Project. My only question would be in regards to the embedded plastic in these blocks on the demolishing of buildings built with Ecoblocks decades from now. Will we have sufficient technology to remove the plastic from the concrete when necessary? For more information on the product and businesses involved, please see links below. What a fantastic win-win initiative – reduce pollution AND make something useful! Far too often we live as if we have a stock of spare Earths at our disposal, as if we can exhaust the resources of this planet and dump the waste back on it and then move onto the next one. It’s heartening to see a company investing in the circular economy like this. I love reading about innovative ideas that will help us with our plastic waste problem so I think I’m just as excited about this as you are! I think plastic incorporated INTO concrete is a much better idea than eco- bricks. When they crumble, or are demolished … all the tiny bits of plastic fly free again. Frightening prospect. 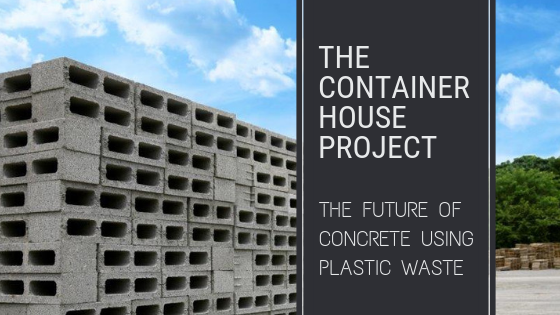 Plastic-concrete could be crushed and reused after demolition?? Yes, you are very right! I hadn’t even considered eco-bricks when writing this article, and I probably should have. I like your idea of re-using the Ecoblocks by crushing them. So simple and yet brilliant! Thank you for your comment.